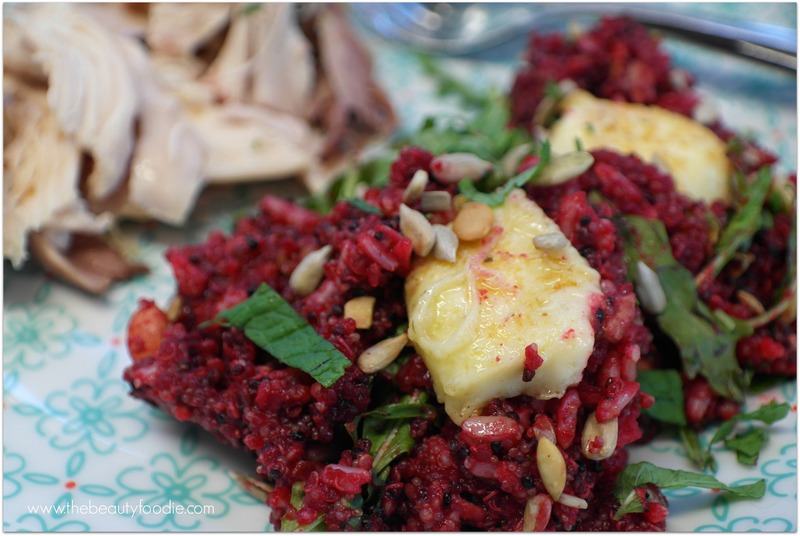 There was one dish in particular that had all of us in heaven – beetroot quinoa with haloumi. My friend Diane and I (possibly more of a foodie than me), launched into a “pick that flavour” frenzy, with the goal of me having a crack at re-creating it. 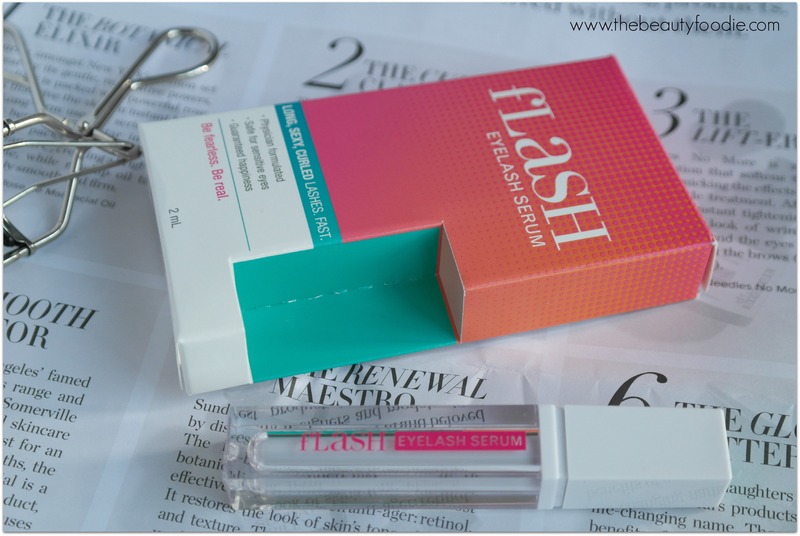 Clearly, as you are reading this blog post, I succeeded and I’m rapt with the result! So here we go, Cable Bay inspired beetroot qunioa with halloumi. This is on my Christmas Day menu for 2015 (I’ve got nothing else in mind so far apart from my Damn Yummy Christmas Ham!). 3 tablespoons raspberry vinaigrette - Prenzels do a good one! *I make extra as it’s damn good!! Heat oven to 180 degrees (bake). When cooked, leave to cool slightly then puree in a food processor/Nutribullet. Bring stock to boil in a medium sized saucepan. Add quinoa. Bring the stock to a gentle simmer. Place the lid on the saucepan. Cook for 15-17 minutes, or until the quinoa is tender. When the quinoa is cooked, remove the lid from the saucepan, fluff it up with a fork a little, add the cooked brown rice. Set aside. Combine all ingredients in a jar and give it a damn good shake. Set aside. Place haloumi on a chopping board.Pat dry with paper towels. Have the shortest end of the haloumi facing you. Slice vertically in half and then slice horizontally into eight even cubes. Heat the olive oil in a pan. Season the slices of haloumi with salt and freshly ground black pepper and fry for 2 minutes on both sides, or until golden-brown all over. To bring the salad together! 2 tablespoons of the vinaigrette (add more depending on your tastebuds). Then, lastly, place the leafy greens on a serving platter. Place the quinoa on top, add the pan friend haloumi, sprinkle with the reserved toasted seeds and mint. 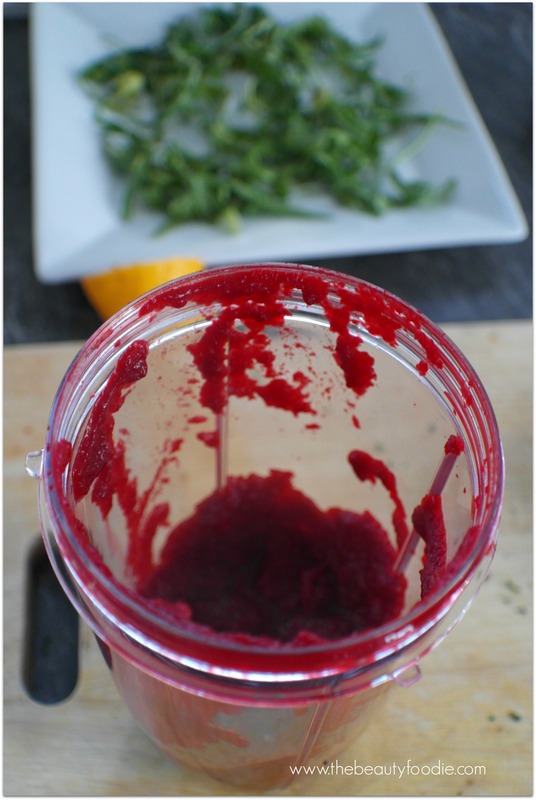 I blitzed up the beetroot in my new Nutribullet. Easy as. Served ours up with a bit of roast bird on the side.